This strange habitat is best recognised as an area of stony, inhospitable-looking ground but which nevertheless in near-coastal parts supports numerous low-growing pincushions of vividly flowering plants with convenient bare patches for walking in between. Widespread throughout the Mediterranean region, garrigue is often a botanists' paradise and is one of the richest habitats for wild orchids, in particular those of the Ophrys genus - the Bee Orchids. Bumblebee Orchid, Mirror Orchid, Sawfly Orchid and the Dull Ophrys are all species that you can expect to see in this habitat, and they are followed slightly later in the season by the glorious bright pink Pyramidal Orchid. The relatively open nature of this habitat makes it easier to see some of the other wildlife that lives in the Garrigue. Numerous beetles can be seen scurrying between the plants and lizards and snakes can be found there in good numbers. A cautious approach is still required for those who want to see and photograph the reptiles, because once they are disturbed and disappear into the dense plants they are almost impossible to dislodge. While the flowers are still out and there is nectar to be found, Garrigue is a good place to see butterflies too. Once the flowering time is over and the real summer heat arrives, the plants survive by dying back completely from the suface of the ground although the perennials continue their growth cycle beneath the soil. This period of dormancy is similar to the activity carried out by plants in northern Europe during the winter. The Algarve landscape in July and August is so barren and brown that it is hard to believe the riot of colour that has existed during spring and early summer. 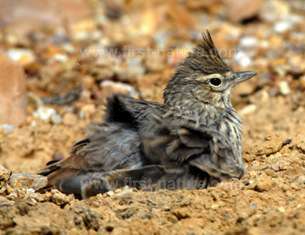 Garrigue is not a particularly good habitat for birds although certain species of warbler favour it, and it is a good stronghold for the Thekla Lark. A glance upwards can be rewarding, however, as the Garrigue is good hunting ground for the birds of prey that dine on the snakes and lizards that live there. Garrigue habitats are easy to find in the Algarve and most often lie just behind the coast in between the beaches and the more fertile ground further inland. 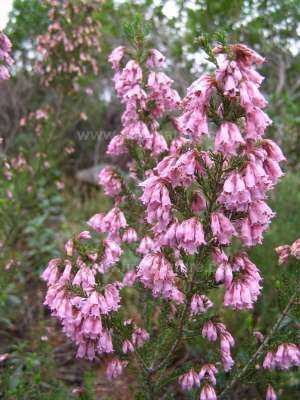 Although generally made up from evergreen shrubs, the 'maquis' section of barrocal habitat found at higher levels in the Algarve can also consist of some deciduous trees and shrubs. Two of the most characteristic plants of this habitat in the Algarve are the Mediterranean Strawberry Tree (Arbutus unedo) and various types of tree heath (Erica multiflora and Portuguese Heath Erica Lusitanica are both common) along with several species of cistus. Juniper bushes are also common. The best way of seeing this type of habitat is to head away from the coast and go up into the hills. The bare stony ground soon gives way to slopes of cistus and then a more varied landscape consisting of trees and many species of shrubs. Photographing plants in the Maquis can be an uncomfortable experience: not only are the plants so densely packed together as to make the habitat virtually impenetrable, but many of the trees and shrubs are spiny, and others, such as Gum Cistus (Cistus ladanifer), are extremely sticky. Despite the dense nature of Maquis and the seeming lack of flowering plants on the ground, there are gems to be found for those who look hard enough: the Brown Bluebell (Dipcadi serotinum) is often seen sheltering beneath the outer edges of the shrubs, as is one of the orchid species not found (as so many others are) in the Garrigue, Broad-leaved Helleborine (Epipactis helleborine). The first encounter with Dipcadi is quite a surprise. It resembles our own Bluebell but has lovely coffee-coloured flowers which make it quite hard to spot in the sheltered areas where it grows. 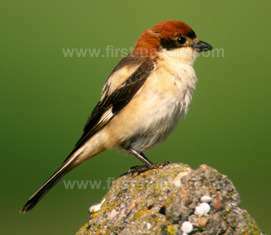 The Woodchat Shrike is a summer visitor to the Algarve. Picture Ray Tipper: Licence enquiry.. There are two subspecies of the Broad-leaved Helleborine (Epipactis lusitanica and Epipactis tremolsii) growing in the Algarve, and they are both found at higher elevations, and so a trip up towards Monchique is a good way of finding them. The flower colours of this orchid are extremely varied in the Algarve and range from cream and green to deep pink, but despite the depth of pink colouring in some of the flowers Dark-red Helleborine (Epipactis atrorubens) is not known to occur in the Algarve. Another lovely and very seldom seen flower that can be found under dense vegetation is Fritillaria lusitanica - a bronze beauty with a lovely chequered pattern on its petals. Because so many of the trees and shrubs that grow in the Maquis are very well endowed with flowers it is a great place to see some of the butterflies and other insects of the region. The shelter provided by the dense thicket of shrubs and trees also makes it an ideal place for snakes and lizards although they are much harder to see there than they are in the more open ground of the Garrigue. Birds are more plentiful in the Maquis than in the Garrigue, and in April and May Cuckoos sing in the hills and you may catch a glimpse of a Woodchat Shrike which is a summer visitor to the Algarve and particularly likes shrubby areas. 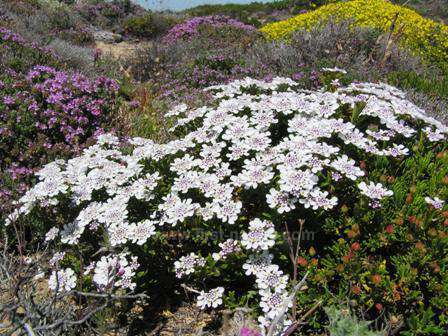 The Maquis is a particularly good area for seeing the many different types of cistus that thrive in the Algarve climate: Gum Cistus, Grey-leaved Cistus (Cistus albidus) (which has large pink flowers), Sage-leaved Cistus (Cistus salvifolius) and Narrow-leaved Cistus (Cistus monspeliensis) are all easily found on a walk through these shrubby habitats. In the Walks section of this website we offer a list of places to walk so that you can enjoy the various habitats of the Algarve and the wonderful wildlife, plants and fungi that inhabit them.